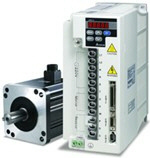 The A+ series is a new type of omnibearing integrated servo system with advanced functions. It is able to combine with medium / high servo motors from 3kW to 7.5kW ( torque output from 19.1 N-M to 47.74 N-M) and is equipped with incremental 20-bit (1280000 ppr) optical encoder, providing more accurate positioning control for high-precision processing industries or the machine applications where high responsiveness and stiffness is needed to reject high torque disturbances. With A and AB series, Delta provide a complete servo product line (from 100W to 7.5kW) to fully support our customers’ needs and offer various options for high torque applications. 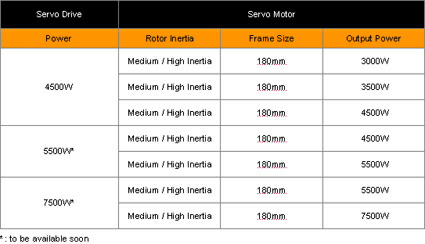 Medium / High inertia servo motors are available including: 3kW, 3.5kW, 4.5kW, 5.5kW, 7.5kW. Max. input frequency: Line receiver 4Mbps for high-speed motion command. Purchase your Delta ASDA-A+ AC Servo Motors today!